To understand why Phil Keaggy is receiving ASCAP's Golden Note Award, you really need just one album. One evening in 2008, I joined a few hundred people at Judson University's chapel to watch—and hear—a bit of history. 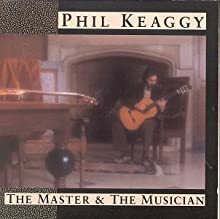 Phil Keaggy, backed by a full band, was playing every note of his magnum opus, 1978's all-instrumental album The Master & the Musician. The maestro guitarist and his bandmates played the entire record in sequence, and received a rousing ovation afterward. It was the 30th anniversary of that record's release, so Keaggy celebrated with a handful of such concerts. (Here's one of the songs from that tour). Many who attended were, like me, 50-somethings who had bought the album when it first came out. We were still young in our faith and excited about the new Jesus Music, which had not yet evolved into the mega-marketed, multi-million-dollar empire that we now know as Contemporary Christian Music (CCM). The Master & the Musician went on to become his best-selling record, and Keaggy went on to grow with the industry—sometimes comfortably in the middle of it, sometimes on its edges, sometimes eschewing it altogether with indie releases that included little, if any, overtly Christian content. Keaggy didn't write for record companies. He didn't write for radio. He didn't write for the church. His songs weren't crafted to fit any sort of formula.